History: (X-Factor Annual#1) - When the mutant hunters known as X-Factor came to Russia to advise the government on its mutant problem, Iron Curtain and another member of Blind Faith's mutant cell attacked X-Factor at the airport, and tried to take Robert Drake captive, but the second mutant was shot in the back and killed. Iron Curtain escaped. After Drake had been captured by Doppelganger, the mutant in charge of a facility where mutants were being experimented upon in brutal fashion, a cell member named "Holy Grail," saw Drake being taken away, and advised Blind Faith and Iron Curtain, who intercepted Drake. They brought Drake back to one of their bases to interrogate him, but when Drake came to, they learned that he was a fellow mutant, Iceman. 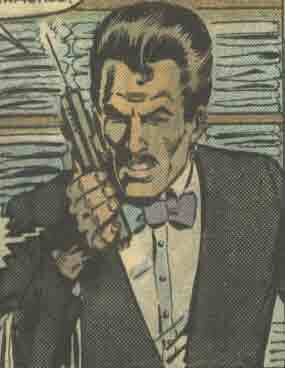 Iceman joined Blind Faith, Iron Curtain, Mentac, Siberian Tiger and Concussion in raiding the facility where Doppelganger operated, and with X-Factor, helped bring the mutant prisoners there to safety. 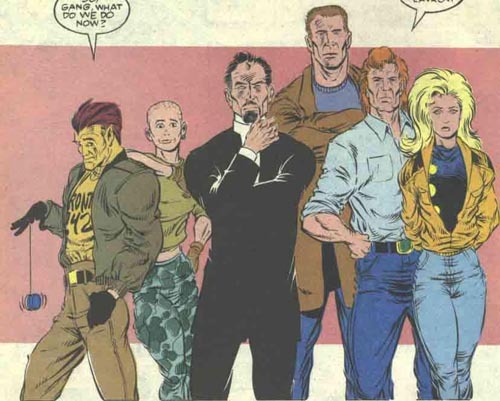 In order to maintain X-Factor's cover identity as mutant hunters, and explain their disappearance, Blind Faith and Iron Curtain posed as kidnappers, and turned themselves over to the KGB. Blind Faith subsequently used his powers so that he and Iron Curtain could escape the KGB's custody. (Soviet Super-Soldiers#1) - When the former Soviet Super-Soldiers Vanguard, Darkstar and Ursa Major were being held by the Russian government, Blind Faith led a rescue mission at the facility in Siberia where they were kept, using his hypnotism to get them out of the building, with the aid of his friends Zoya Vasilievna and Arkady Tegai. The three heroes were introduced to Mentac, Iron Curtain, Sibercat and Concussion, and admitted into their ranks. The team hid out in a farmhouse in the Ukraine, but they were discovered by the cybernetic soldier Firefox, who killed Mentac and Iron Curtain, and forced Concusssion to provide information on the safehouse system before killing him. Ursa Major, Vanguard, Darkstar, Blind Faith, Stencil and Sibercat hid out in an apartment in Novosibirsk, Siberia, but were found by the military. After a skirmish with them, they teleported away using Darkstar's powers. With Firefox and the military decimating the safehouse system, they sought out the Underground Mutant Safe-System on the Black Sea, to convince them to abandon the safehouse system and join them in fighting back. However, the safehouse was again found by Firefox, and all of their mutant allies were slain. They fought back against Firefox and his men, and Vanguard tore Firefox's cybernetic weapons out of his body. Instead of killing him, Blind Faith used mind control to make him confess the military's plans for mutant genocide to the press. The six heroes hid out in another Siberian safehouse as they prepared to fight back. Blind Faith christianed them the "Exiles," and stated their goal to be the overthrowing of the Russian government. (X-Men II#17-19) - Darkstar and Blind Faith investigated the effects of the Soul-Skinner upon the town of Neftelensk, where the entire adult population had been rendered comatose. They were psychically assaulted by the Soul-Skinner, and rendered comatose with the rest of the town. Later, the X-Men arrived and were able to overcome the Soul-Skinner's control over the town, and Darkstar and Blind Faith aided the X-Men in defeating him. (Starblast#1) - Now calling themselves "Siberforce," the team witnessed the effects of the Starblasters' assault on Earth's moon with a Moon Thruster from their safehouse in Siberia. Darkstar and Vanguard decided to investigate. (Starblast#2-4/Quasar#54-56) - Darkstar and Vanguard wound up joining alongside Quasar and other heroes to oppose the threat of Skeletron, and Vanguard was ultimately slain by Threkker. Comments: Created by Bob Layton and Brett Breeding. Since Starblast, Darkstar, Vanguard and Ursa Major have returned to the government's good graces, starting with Daredevil I#369, and Sibercat joined Darkstar and Vanguard in the Winter Guard as of Iron Man III#9. The fates of Blind Faith and Stencil are not known. 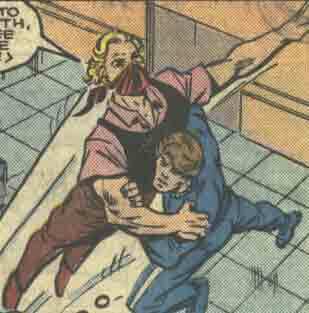 This Russian mutant was a member of the cell, and aided Iron Curtain in an attempt to capture Robert Drake of X-Factor when he arrived in Russia, but he was shot in the back by a soldier while escaping and died. He possessed the power of flight. "Holy Grail" was the nickname of a cell member posing as a waiter who aided Father Garnoff in capturing Robert Drake after seeing him captured by agents of Doppelganger. He used the alias "Holy Grail" for radio communications with Garnoff. It is not known whether "Holy Grail" was a mutant himself, or simply a sympathizer.